This article describes Windsor chairs, noting their evolution, their different styles, their popularity in America (from shops that made them to farmers who created homemade versions), and some prominent chairmakers. It originally appeared in the September 1945 issue of American Collector magazine, a publication which ran from 1933-1948 and served antique collectors and dealers. If the Windsor chair had been invented in the 20th Century it would have been classified as functional furniture and rightly so. Perfectly adjusted to the human body, using no excess of material, it had all the sturdiness of the modern chairs of metal tubing without their bent-pipe severity. 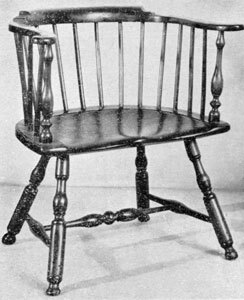 A Philadelphia Low-Back Windsor: This chair with characteristic blunt-arrow turned legs and shaping of the seat, dates between 1750 and 1770. Yet when it first came to popular notice, back in the early 18th Century, no one called it anything in particular, since the age of labels had not arrived. It was just a simple piece of cottage furniture, made in English country workshops from yew and elm gathered in the forests of Buckinghamshire. Nor was it a new form even then, for strictly speaking there are no new styles, in furniture or anything else, since all will be found to have developed from an earlier and usually cruder idea. The ancestor of the Windsor may be seen in the extra-functional, three-legged example shown here. This type made in the 13th Century and was sturdy enough to support even a knight in full armor. 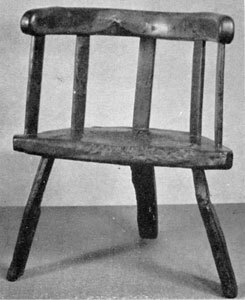 An 18th Century Bow-Back Windsor: Signers of the Declaration of Independence sat in such chairs of which one still survives. From this clumsy beginning the Windsor, or turned chair, developed into the graceful form as we know it today. It reached its highest point in beauty and variety of detail at the hands of American craftsmen. English cabinetmakers had already devised the splayed legs, the saddle-shaped seat, the graceful curved spindle back which terminated in delicately shaped yet sturdy arms and, having turned out a piece of furniture practically perfect for its purpose, they continued to fashion this chair for country cottages and inns with but little change through the years. Philadelphia High-Back Windsor: Here the nine spindles of the back have been lengthened and surmounted by comb. Turnings and shape of seat are characteristic of the period of 1750-1770. True, the Chippendale influence induced some cabinetmakers to put a vase-shaped back splat in place of the spindles normally found in the bow-back type and sometimes cabriole legs were added. The comb-back was another variation that appeared during these years. Such chairs were apt to be made of mahogany, were rarer, and not strictly of the cottage type though the basic idea was still present. However, chairs were obviously made to be sat in by all sorts and conditions of people and a type so nearly perfect for the purpose would naturally find favor with both the cottager and the lord of the manor. A Philadelphia Windsor Bench: This is unusual in that it was made principally of curly maple. This carving of the knuckle arms and turnings of the stretchers are typical of the work of Pennsylvania Windsor chairmakers from 1760 to 1780. In fact, there is the well-worn tale regarding royalty and this cottage chair with the scene laid in the lea of Windsor castle. A nice bit of romance to account for the naming of the chair, but it will do until something better is thought of. The village of Windsor was of course only one of many places where such chairs were common, but it is quite likely they first came to public and popular notice there. A Late Windsor: This is typical of the Windsor chairs made in the early days of factory produced furniture. Such chairs were widely used, especially in country hotels, lodge rooms and stores. They reached America by way of Philadelphia about 1700 and, in a country whose original settlers had with few exceptions been more used to cottages than castles, found speedy favor. Our craftsmen began making them and the idea spread along the Atlantic seaboard northward to New England where they were at first known as Philadelphia chairs. Not a few cabinetmakers who had previously been general practitioners now became specialists, not only of chairs but of Windsor chairs. They were located in Philadelphia, in New York, and in the various towns and cities of New England. The first English examples were practically perfect as to design, but the American chairmakers added a few ideas of their own and brought them to a high state of structural and ornamental detail with various localities making distinct types. Today, one who knows his Windsor chairs can tell whether their makers worked in New England or Philadelphia by noting the turnings of legs and spindles and the shaping of the seat. A Farm-Made Windsor: It was made in New Hampshire about 1800-1815. The turned parts were bought at the local general store, the rest fashioned at home. Just how many makers of Windsor chairs there were in America in the years before factory production put an end to individual cabinet-making is not known but it is safe to say that there were probably few towns in the areas already mentioned without at least one shop where such chairs were made. Further, the simple type of Windsor was so cheap and easy to make that many a farmer, handy with tools but thin of purse, produced very presentable chairs, settees, and other Windsor type pieces for his own home. 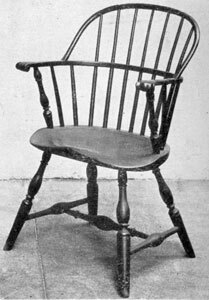 Chairmaker and farmer alike used native woods, such as oak, ash, hickory, pine, and white wood. The two latter woods were favorites for making the seat; hickory was an excellent substitute for the yew of old England. Structurally there might be said to be but three kinds of Windsors, the low-back, the bow-back, and the comb-back, but the variations on these themes were many. English Ancestor of the Windsor: This hand-hewn oak chair was made circa 1650, about a half century before the design of the Windsor became established. As already stated, English Windsor chairmakers permitted their product to have at least a bowing acquaintance with the prevailing Chippendale designs; with American chairmakers styles came and went but their Windsors remained a law unto themselves. Only during the Sheraton years did any outside style influences filter into the original design and so produced the rod-back type. This dates from the early 19th Century and is not only a variation of the true Windsor but serves as the connecting link between it and the painted fancy chair which belongs to the turned chair family but is neither as sturdy nor as comfortable as the Windsor. 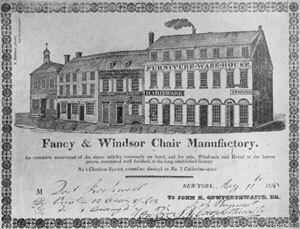 Bill of John K. Cowperthwaite, New York Windsor Chairmaker: Dated May II, 1825, it shows his shop at 4 Chatham Square with those adjoining it. Cowperthwaite, like many others, made both Windsors and fancy chairs. Obviously a perfectly designed chair like the Windsor remains in favor indefinitely, whatever the fashion in other furniture may be. The proof of it is that it is still made today in both England and America. The years of the collectible Windsor, however, range in America from about 1725 through the first quarter of the 19th Century and perhaps a few years beyond. By 1840 though, a decadent form, heavy and unlovely, and, though not as crude, bearing real family resemblance to its ancestor of the 13th Century appeared in country hotels and other public places. So for a time even the Windsors were struck by the prevailing blight in furniture taste that characterized the mid-19th Century. 18th Century New England Windsor: The way the back is made in one piece and bent into a U-shape shows the skill of its maker who was working late in the 18th Century. But during the 18th Century, when chairmakers were putting their best furniture thoughts into the development of the Windsor, many beautiful types appeared. Beginning with the locale where they first appeared in this country the very earliest were of the low-back type having ten to twelve plain spindles fitting in to a U-shaped toprail. From this as a basic point it was easy to evolve the bow-back and the comb-back with their accompanying variations. To go into great detail regarding the variations and decorative details whipped up by the chairmakers of the Atlantic seaboard, each with ideas of his own, would be unduly prolix and tedious here. Besides, illustrations tell far more than pages of description. Further revelations regarding the many variations on the Windsor theme are to be found in Edgar J. Miller’s American Antique Furniture, Volume I, pages 260 through 271. 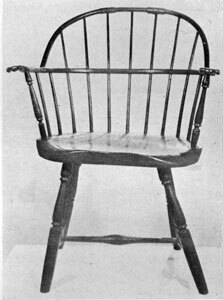 A Rhode Island Windsor: It was made sometime during the first quarter of the 19th Century and has shaping and turnings typical of chairs made in that state. Among the American makers of these chairs, the earliest known was one Rich-monde of Philadelphia who was working there as early as 1763. It is believed that he made the chairs in Independence Hall where sat the Second Continental Congress and where the Signers of the historic Declaration convened. These excerpts from New York advertisements are an indication of what went on in other chairmaking centers. They show that American makers were proud of their products, that they suffered somewhat from English competition (the latter may have been the goad needed for improving on the original models), and also between the lines can be read the rumblings of coming conflict between the mother country and her colonies. I purchased a set of six what were labeled as Windsor chairs and I am trying to research them. They have the two braces. Two have arms and are the largest and the other four are a bit more small without arms. I am resarching and questioning because I cannot find these same chairs for which the middle piece is a decorational ornamental piece. Do you have any clue as to if these are Windsor and from what time frame possibly. I noticed the time frame is from 1700s to low 1900s. Just very curious buyer. Thanks for the time of reading my inquiry. Please if you have any (English) information on Windsor Makers Trade Cards or any general written comments regarding English Windsors I would be most gratful if you could let have it for my records. The makers name that is important to me in my research is ( Mundy )the Mundy family made chairs for the Bodleian Library and Jesus College in Oxford. I would be gratful for any help with my request. I have a set of six chairs in Windsor form. They only have 3 spindles in the back, plank seats. The spindles have 4 rings grooved into each 1/3rd the way up from the seat. The color appears to have been mustard with black lines trimming with colored flowers on the front of the bow. Under the seat has no paint. The top of the seats are 16 inches tall, the top of the bow measures 32″ tall. Not sure what the wood is, seems to be a softwood, but not pine. Several of them need work, we have used them for years as dining room chairs. Bought them in North Carolina in 1988. Most of the paint is gone, I’m thinking about repainting them in the correct color and using them for another 21 years. Any idea what they are and age? Thanks, Dan. I was taken aback when I saw the photo of the 18th century Bow-Back Windsor – I have the exact same piece in my living room. This is from our family, handed down along with the story of how it was used in Philadelphia and Boston during and after the American Revolution in the legistlature by a family member. It has never been restored, just well taken care of. Do you have any advice in maintaining it so it continues to survive as a family heirloom? I have 2 old windsor chairs from my grandparents (born in 1890) or possibly their parents…there is a red stamp on the bottom. but it’s hard to read…looks like W.P.W.U and then a blotchy letter and undernearth that NO 1775…any idea when they were made? I have what I was told is a 18th Century Windsor 3 drawer secretary desk chair. I went to the library and found similar, but not as grand as this chair. I read that these types of chairs were used in the court houses. Do you have any idea where I may find other information on this chair? I have two Conant Ball Makers 1852, #3527/210 and #3527/940. Still strong, but varnish gone from many washings. How can I best restore.